Raised by Ryan McPherson, Glidden Points have been legendary for 25 years. 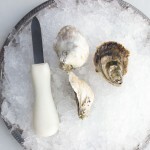 They are bottom planted in the cold Damariscotta River and slow-grown, not harvested until 4 years of age, leading to a large, firm, strong-shelled oyster. They are one of the only oysters in the world hand-harvested by divers. One of the priciest oysters in the country, and one of the most prized. I have talked to the company and they have several different locations that are all called Glidden Point. Only one of those locations is the deep area that they dive. I have had them when they are 5 star but what I usually get are 4 star. I will have to order them directly and then I can choose the location. I usually order from The Lobster Place where I can get 10 different types of oysters just a few of each, each time I order. Highly recommended. Luckily available at Ryleigh’s oyster in Baltimore, MD. Shells about 3” to 4”, creamy flavor, followed by great salinity. An exceptional Virginica variety and a rare treat. The bomb! The Gold Standard of Maine oysters, in my opinion. And the Scully story is legend. A lot of flavor in these meaty monsters. I love these with Scotch, especially Laphroaig. I’m the odd one out, but I wasn’t overly impressed with this oyster. All around it was salty and pleasant, but didn’t have a lot of character. Tasted in September. Full agreement that this is an amazing oyster. Ocean plus buttery, and very substantial. Top notch. Had these delicious oysters at Eventide in Portland. Just returned from a quick trip to Maine where we picked up 4 dozen Glidden Points….they continue to be beautiful oysters of unbeatable quality and taste. I came for the brine and stayed for the crisp complexity and that famous firm texture. I dare you to find me a better oyster. Even as a broke college student, I still save up for these bad boys. Again, Rowan is right: These oysters are awesome. They’re easily the most expensive in the state, and have been in short supply in recent years. Briny with a clean crisp finish. You can’t eat just one! We stop at Glidden Point on our way to a summer cottage on a small island off the mid Maine coast to get into our Maine life and then stop on our way home to try to continue the great taste of Maine at least for another hit of a real oyster at home. Let’s face it–these are the best oysters in the country. Nobody lets their oysters slowly find their own perfection of form like Barb Scully. Four years, five years–whatever it takes. The oysters get deep cups, noble shells, and firm, substantial meats. They are bottom-planted deep in the icy Damariscotta River and harvested by diving (April thru November only), which contributes to their depth and intensity of flavor. Ask for the single-lease Selects (Bristol, Newcastle, and Ledge) if you get the chance. I cannot improve on Rowan’s review of the Glidden Points. The “select” size are big and briny. Yes, I do agree that that the hard (and) heavy shells make for good shuckin’ at the hinge. Simply the best! Take your time when enjoying.